There is a good chance that salvage radiation will destroy any cancer in the prostate bed and seminal vesicle bed. But if I already have micro-metastases distant from the prostate bed, radiation will not be curative and I will have risked the side effects including impotence, incontinence, and bowel damage, without benefit. How can I learn if my prostate cancer has already spread? Traditional CT Scans and Technetium Bone Scans are virtually useless for detecting metastases when PSA is low (NCCN guideline PSA <10). But, now a new PET/CT scan using Gallium 68 PSMA appears to be a 'game changer' that helps identify when small amounts of cancer are beyond the area normally irradiated for rising PSA after therapy to the prostate. To try to rule out distant metastases, I joined a Gallium 68 PSMA PET SCAN clinical trial at the University of California, San Francisco (UCSF). As of May 2018, the scan is only available as a clinical trial because the FDA has not yet approved the scan. Long term testing of G68 PSMA PET SCAN in Germany, Australia, and India has proven it is the most sensitive scan we have for identifying small metastases anywhere in the body. I take dutasteride because it lengthens my PSA doubling time from around six months to 22 months. I know this because I have tested going off the drug twice. Dutasteride suppresses PSA in the blood, so I should double my PSA number from 0.4 to 0.8 when evaluating my treatment options. Published data suggests that about 50% of the time a G68 PSMA PET/CT will detect my cancer. If scanning identifies distant metastases, that would change my treatment choices. After sending in my medical records, UCSF approved my participation and an appointment was scheduled. At the appointment, my details were confirmed and paperwork signed. I have Medicare and Plan F supplemental. I was informed Medicare will pay for the PET scan but not for the experimental G68 PSMA tracer, for which I will be required to personally pay about $900. In the room with the PET/CT scanner, I was injected with the radioactive tracer from a special shielded canister. After waiting a few minutes for the tracer to be taken up by any prostate cancer cells, I was placed on the narrow table in front of the donut shaped scanning machine. The table inserts you, several times, back and forth through the donut hole in the machine. The machine makes a lot of whirring sounds along with various clicks and clacks. You have no sensation of the low levels of radiation that are flying around the room or glowing from inside your body. The radiation technologist is safely controlling the machine from outside the shielded room. It is hoped that any prostate cells will attract the G68 PSMA marker and show up as a glow in the PET scanner image. The CT scan will orient the location of the glow to the patient's anatomy. 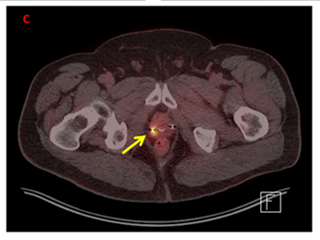 In my scan, CT detected a 10mm x 12mm lesion where my cancer was “stuck” to my bladder at surgery. Curiously, this lesion did not take up the G68 tracer. Does that mean it is not cancer? Maybe only scar tissue? There was an addendum to my radiologist's report that identified a small amount of tracer being taken up in the area of the removed seminal vesicles. That could be expected since I had cancer in my seminal vesicles. The good news is there were no signs of prostate cancer anywhere else in my body. But with my low PSA, it is still possible I have micro-metastases somewhere. What should I do with this information? I met with a radiation oncologist at UCSF who commented that I had gone 14 years without much going on, implying there was no big rush to do something. When pressed, he said the 'standard of care' would be salvage radiation with IMRT. He said the risks of radiation side effects such as incontinence, impotence, and bowel damage were small, but real. The process would require about 40 daily treatments. He would not preventively radiate the lymph nodes or pelvis. My insurance would pay for most of it. Retired medical oncologist Dr. Ed Weber, who recommended the PET scan, says I am in a good place and I have the option to continue waiting and get another scan in six months. I am 70 years old and have a heart pacemaker, but no coronary artery disease. No one knows how long they will live, but online calculators predict half of men age 70 will live longer than 85 years (https://www.ssa.gov/oact/population/longevity.html). If my PC continues its slow growth, in maybe 10 years, at age 80, I could be getting into trouble from PC metastases if I do nothing. If that happens, I am likely to respond to a cycle of three drug hormone blockades that may put me into remission for more years. And given the rapid introduction of exciting new treatments for prostate cancer, in ten years there likely will be even better options for me. But hormone blockade at age 80 is no picnic for any man. So should I risk the small chance of bad side effects, and spend two months getting daily radiation? I am still procrastinating and trying to decide. If radiation put me into long term remission, it would be very comforting to stop my PSA from rising every year. Even though I’m still deciding, I have all the information to make my own choice, and that’s exactly what every patient needs. Learning the information provides us a knowledge and ability to make educated choices for our future. There are three other circumstances where high resolution imaging with G68 PSMA PET/CT may be helpful. For men newly diagnosed or untreated, who have intermediate risk or higher diagnosis (Gleason >=7, PSA >=10), high resolution imaging has the best chance of identifying cancer outside the prostate. Men undergoing systemic treatment such as hormone blockade or chemotherapy can use high resolution scanning to learn if the treatment is working and the amount of cancer detectable is decreasing. If he is not responding, other treatments may be tried. Recent clinical reports indicate that some men with a small number (5 or less) of distant metastases may benefit from spot radiation to the lesions. This is called oligometastatic disease. With spot radiation, men have been able to delay systemic treatments such as hormone blockade or chemotherapy. This delay improves quality of life. A minority of men have achieved durable, longer term PSA remissions. Nathan Roundy has been involved in prostate cancer research, advocacy, and support since he was diagnosed with high risk PC in 2004. As database manager for Dr. Leibowitz, he is a co-author on two ASCO scientific publications about the use of a single 13-month cycle of hor-mone blockade instead of radical local therapy. He worked for several years as a PCRI Helpline Facilitator and as Insights editor at the Prostate Cancer Research Institute. He also served as Consumer Reviewer for prostate cancer research with the Department of Defense - SRA Research Program. He continues his volunteer work with the PCRI.